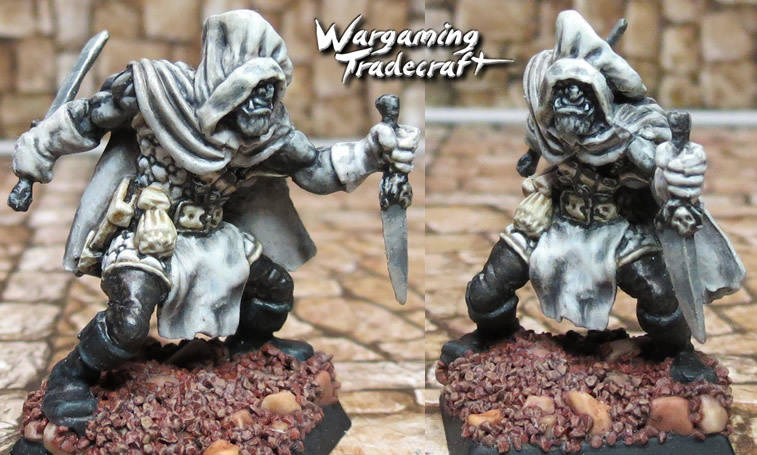 The model itself is one from Reaper Bones. 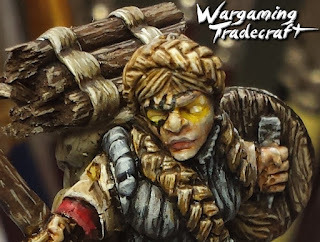 If you want to read about another, take a look at this Dwarven Cleric. 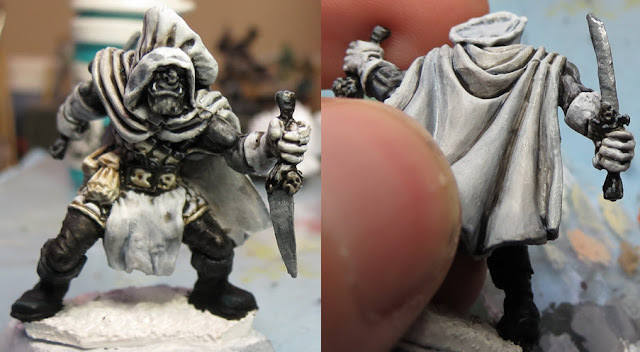 Pictured below is the original miniature and some views of the chef hat. I sculpted a wide trim around the cowl to create the base of the hat, blending it into the cowl edges. * Usually it's a good idea to build new layers of green stuff over dry layers. This gives the first layer a chance to dry and harden so you don't smudge or change sculpting you're happy with. In this case, I next sculpted the rest of the hat in one go. I built it like a top hat first. Then added the striped indents to the side. Finally created the center impression and pulled the top edges out to fan the top of the hat. This then allowed me to push around the floppy chef hat into the shape I was happy with. If I were to do something different another time, it'd be to cut the pointy top of the cowl off first. As I brought the floppiness lower, I had to be careful of the tip poking through. 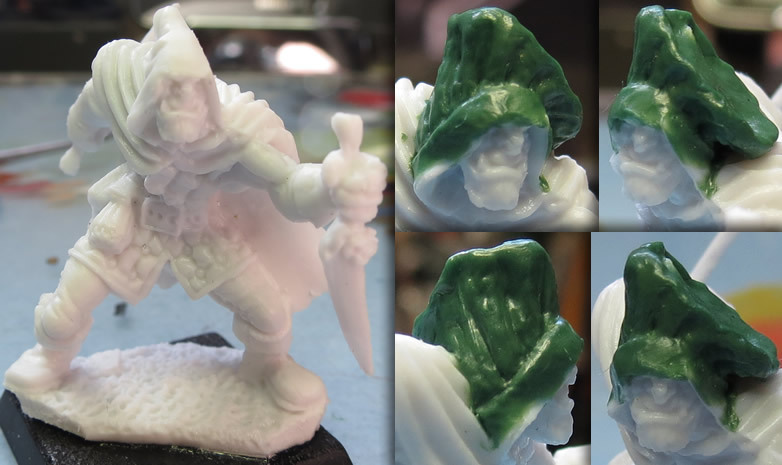 As I touched on in my Reaper Bones Miniatures Review, I have found that some primers chemically react to Bones plastic. 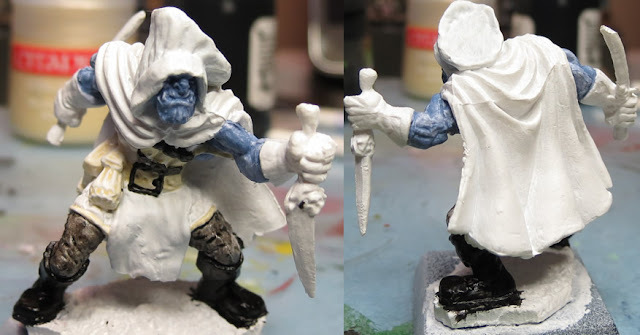 So for this mini, I painted with Gesso to prime it, then hit it with a light spray prime in white to reduce streaks. Ugh, I know, major mold line across the back. I'm sorry, OK? Forgive me? Black and White only or Greyscale? If you choose Greyscale, will there be any strong white or black? Will you include off-white and off-black? Will you add a contrasting colour? ex; Red is often used. Will there be any colour? I've written previously on colour theory and black and white compositions, so if you want more detail, take a read there. Then I hit it all with some dark washes. Black on the black and white areas, brown on the beige areas. Some highlights with thinned down paints and a bunch of layers. I thin the paint because light colours can appear streaky. You can also read an article (which includes a video tutorial) I created that specifically addresses painting with light colours. I wrote about parkerizing metallics previously, so take a look at the details on his blade there. Basically, it involves using a NMM approach as a base, then shiny TMM paint on the blade edge and to represent scratches. Just about done, but not quite clean yet. For the base, I painted it all with black gesso, then super-glued on some rocks I picked up from Michaels, filled in with smaller rocks from your average hobby store. Note the order - large rocks first, then smaller ones. This is a good look so it appears the larger ones are jutting out of a naturally flowing ground. This isn't always the way to go, sometimes you might want a boulder or rock sitting on top of the ground, but even then, consider that most large rocks are probably indented or have the ground around their base in some fashion. Now, I usually stick to real supplies, but this had the red-stone desert look I was after so I used this fake gravel. While I don't usually paint real sand and flock, I'm not above washing and highlighting this stuff, so that's why it looks a little different at the end. I used some black and grey pigments to smooth out the shadows. Hit the whole thing with a gloss, then a matte varnish.